*Is your flat screen tv mounted to the wall, but you don’t have a spot for your cable box or DVD player? Well this is the item for you. Simply mount this wall mount shelf under your tv. 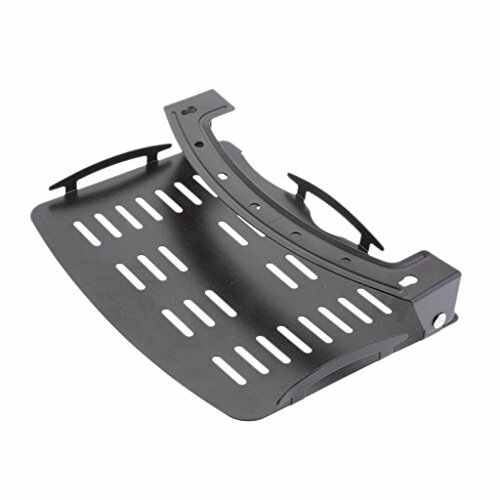 *Elegant, modern and decorative high strength steel plate single wall shelf can carry up to 40 pounds of total weight.Designed to hold DVD players, DVRs, HD recorders, Cable TV Boxes, AV components, gaming systems, for storage of CDs, DVDs and any other media, even to mount projectors. *The angle of the shelf is adjustable on the wall bracket. The shelf is 90°foldable, you can fold it when not using it. *Standard mounting hardware and easy to use instructions included. It is very easy to install. Use multiple units to hang all your components. This shelf can be installed in one corner on the wall with an adjacent on the other corner. Easy to mount the shelf on the wall with the provided wall-mounting bracket. *It will complement your wall mounted TV and help you achieve an uncluttered look with no need for large media stands or TV furniture. Warning:The installer of these products must verify that the mounting surface or wall, will safely support the combined weight of all attached equipment and hardware.